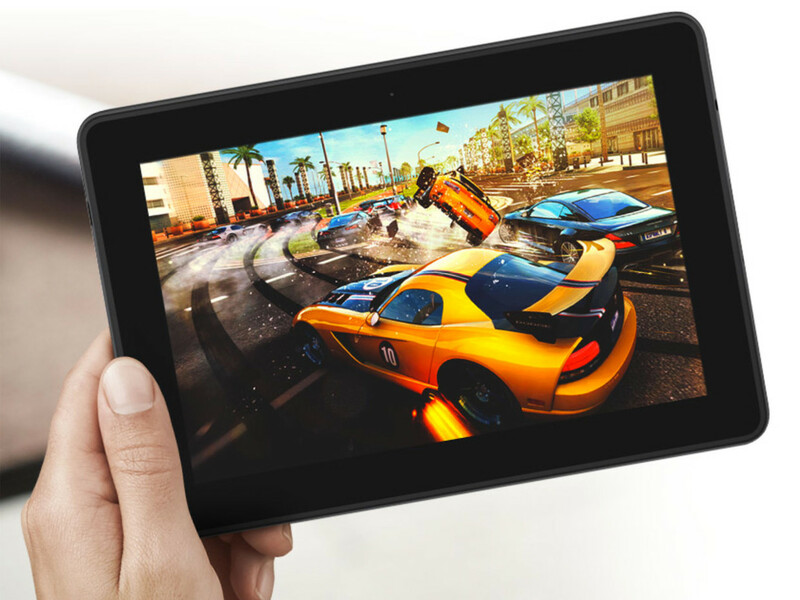 The all-new Amazon Android tablet - Kindle Fire, with a 7″IPS-LCD backlit display with 1024 X 600 pixels of resolution, is a good choice for playing movies. However, Kindle Fire only supports videos in MP4 and VP8 format. So if you have got a collection of DVD movies and want to play them on Kindle Fire, you will get frustrated since DVD videos are not compatible with Kindle Fire. Fortunately, there is an easy and fast way to transfer and play DVD movies on Kindle Fire. You can convert DVD to Kindle Fire supported video formats like MP4 for smoothly playback with a DVD to Kindle Fire converter. Here Aimersoft DVD to video converter is highly recommended. It is an intuitive DVD converter that allows you to easily convert DVD to Kindle Fire MP4 so that you can enjoy any DVD movies on your Kindle Fire on the go. Besides, this DVD ripping tool also provide some video editing tools to let you crop the DVD movies black bars, trim the unnecessary part, etc. for better video watching experience. If you are a Mac user, you can turn to Aimersoft Mac OS X DVD ripper, which can help you rip DVD to Kindle Fire on Mac OS X (10.9 Mavericks and 10.8 Mountain Lion included). Apart from Kindle Fire, you can use it to convert DVD to play on iPhone, iPad, iPod and more. Up to 250+ output format supported. Amazon introduced the Kindle Fire to the market to take on Apple, the computer giant. The Kindle Fire is actually an improved version of the original Kindle that was launched in 2007 and became a bestselling item worldwide. Some of the improvements to this new Kindle include increased processor speed, color touch screen and enhanced internet browsing capability. This tablet has a 7 inch display, a few inches shorter than the iPad's, but it is still functional for viewing. It uses a top notch dual-core processor called the TI OMAP 4, compared to the processor in Apple A5. There is really no comparison because the processors deliver 1 GHz speed. As for storage, the Fire comes with 8GB, plus the option get free storage online via Amazon Cloud. The Kindle Fire has unique features that you cannot get from most manufacturers, including access to huge media content on Amazon. Purchasers can gain easy access to more than 100,000 movies and television programs, countless number of games, reading materials, and more. It is also possible to read magazines which are displayed on the touchscreen in more than 16 million vivid colors. Amazon Kindle Fire might not have many advanced features, but it is available for a fraction of the price. Get ready for the conversion? Just download the right version and follow the guide to import DVD movies to Amazon Kindle Fire with ease. The ways to convert DVD to Kindle Fire on Mac and Windows (Windows 8 included) are the same. This below guide uses the Windows (Windows 8 included) version screenshots. Just make sure you download the right version. Set the destination folder to save the converted videos and choose the output format as MP4. Then you can click "Settings" to edit output parameters like resolution, frame rate, encoder, etc. as you like. When everything is done, click the "Start" button to start converting DVDs to Kindle Fire MP4 videos. 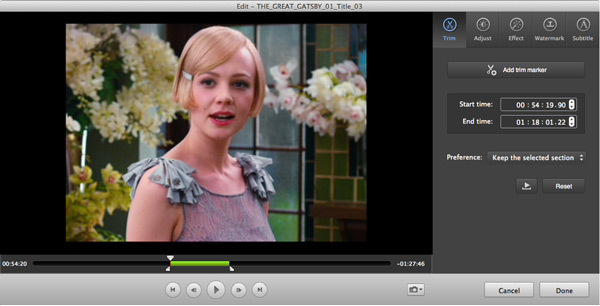 After the conversion finishes, you can get Amazon Kindle Fire supported MP4 videos in the output folder. Then you can connect your Kindle Fire to computer and transfer the converted DVD movies to it for playback on the go. The steps to convert DVD to Kindle Fire playable format on Mac is also easy. Please make sure you've downloaded the right version. Install Aimersoft DVD Ripper for Mac on your Mac and launch it. When the main window pop up, directly drag the files to be convert into it. You can also click "File" > "Load DVD Files" from the menu bar on top of your Mac's desktop. 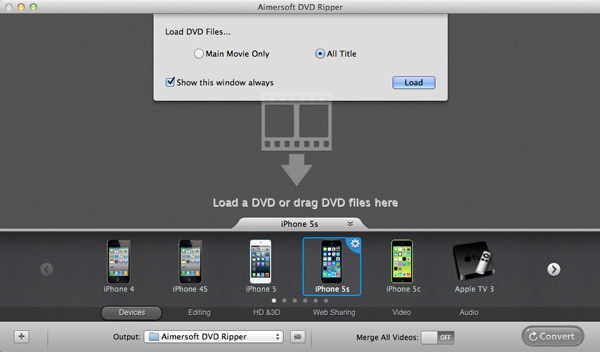 Aimersoft DVD Ripper for Mac also offers various optimized preset for mobile devices, game hardware, Apple software like Final Cut pro, iMovie and more. 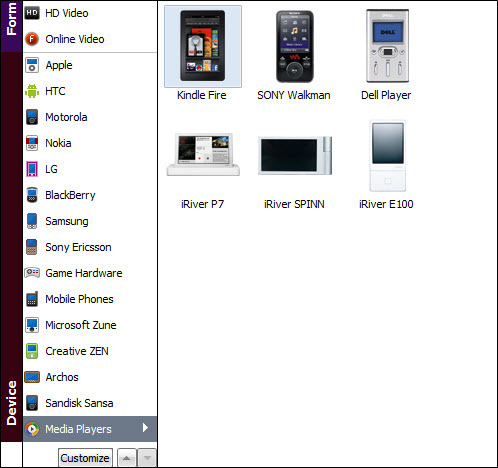 Here you can choose "Kindle Fire" from the "Devices" output format list on the bottom of the main window. As you can see, this DVD to Kindle Fire converter also lets you edit DVD movies as you like. When you finish all settings, simple click on the Convert button on the mian window and Aimersoft DVD Ripper will do all the rest for you. When the ripping process is finish, you can connect your Kindle Fire with USB cable and transfer the converted files for watching on it. The grammar blips in the ad make me wary. Was this written by an American?